Reaching for my flat iron, curling iron or hair dryer in the mornings is like reaching into a mystery grab bag… I never know what I’m going to pull out. My hair styling tools are so unorganized! 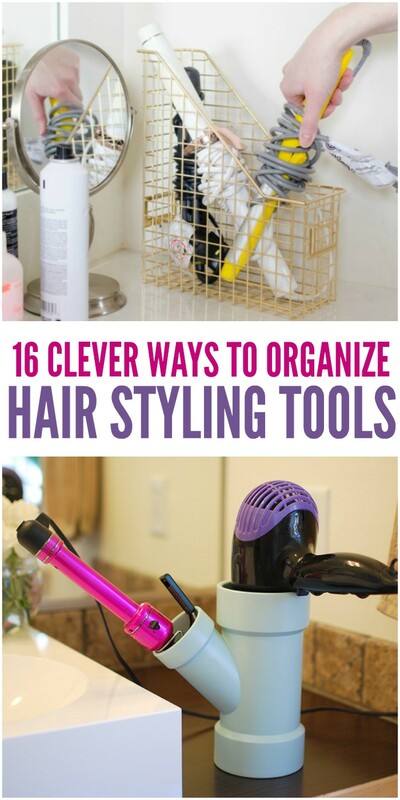 So, in my search for ways to get them under control, I’ve found 16 totally clever ways to organize hair styling tools. 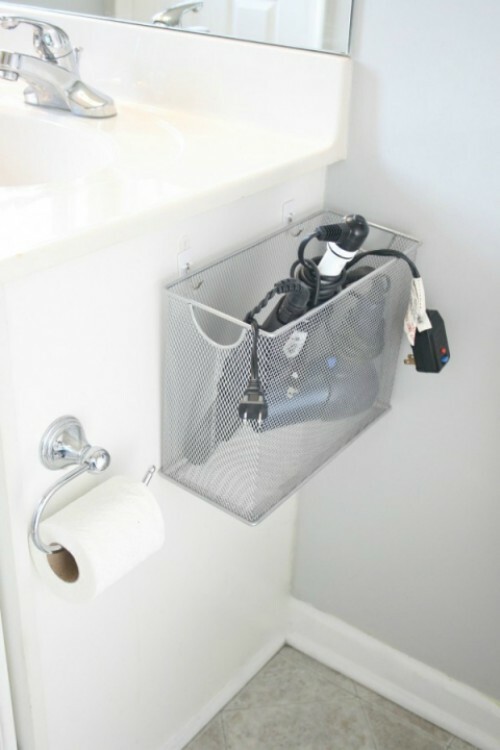 From repurposing a file box or magazine holder to building your own custom organization station, you’ll find a way to tidy up your tools and get your bathroom or vanity organized here. 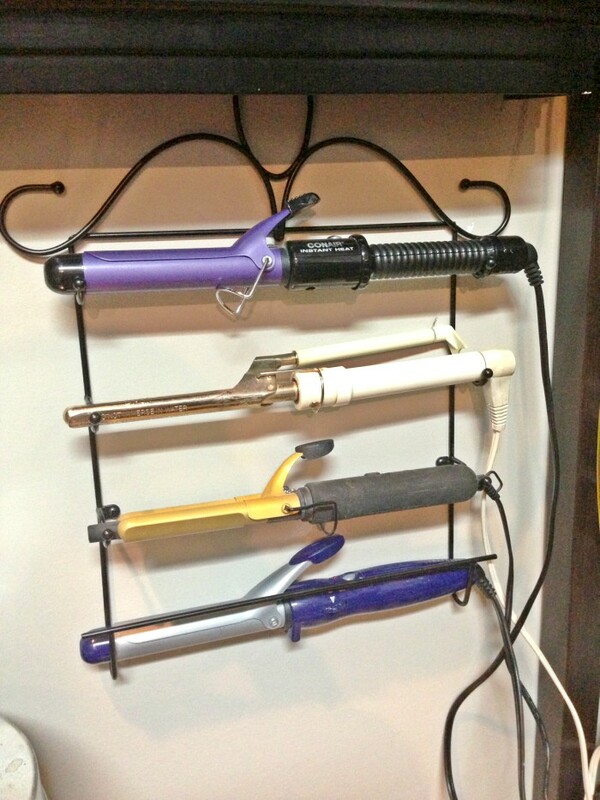 Attach a magazine holder to the wall or to the inside of a cabinet to hold your hair dryer, flat iron, and curling irons. Such a simple idea, but brilliant! 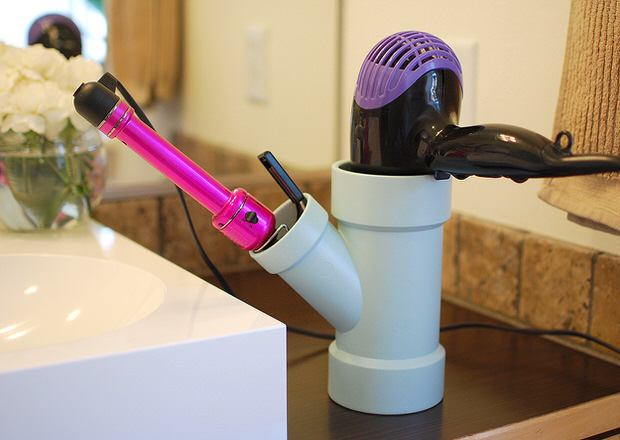 Make your own affordable hair styling tool stand out of PVC pipe. It’s super easy, and it’s functional. 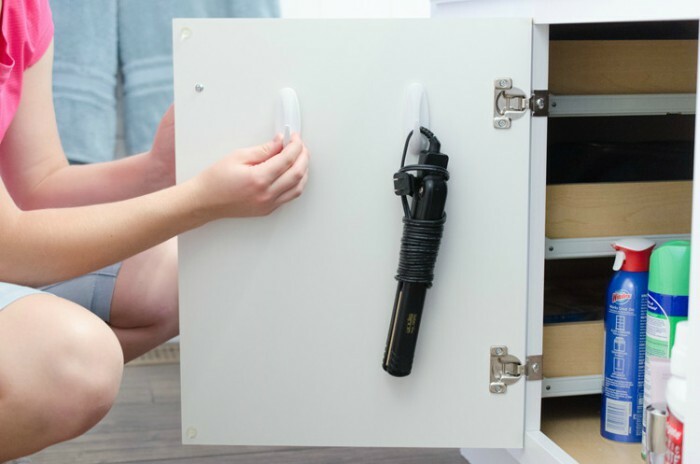 Or attach pieces of PVC pipe to the inside of the cabinet to create PVC curling iron holsters for all your different-sized irons. I know I have several! 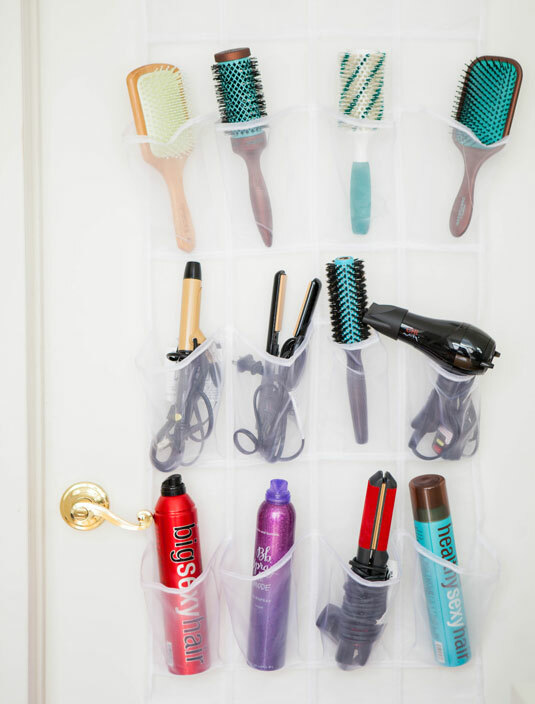 One family built a hair organizing station that’s simply brilliant. 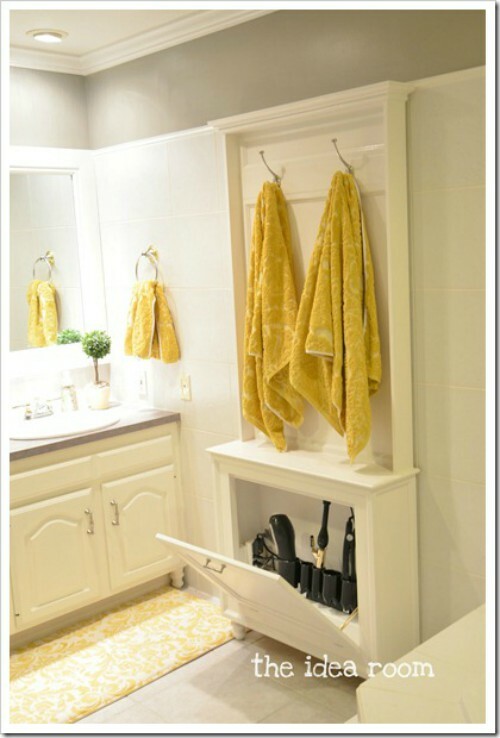 Towel hooks are placed above, and the hair tools are hidden away until they’re needed. 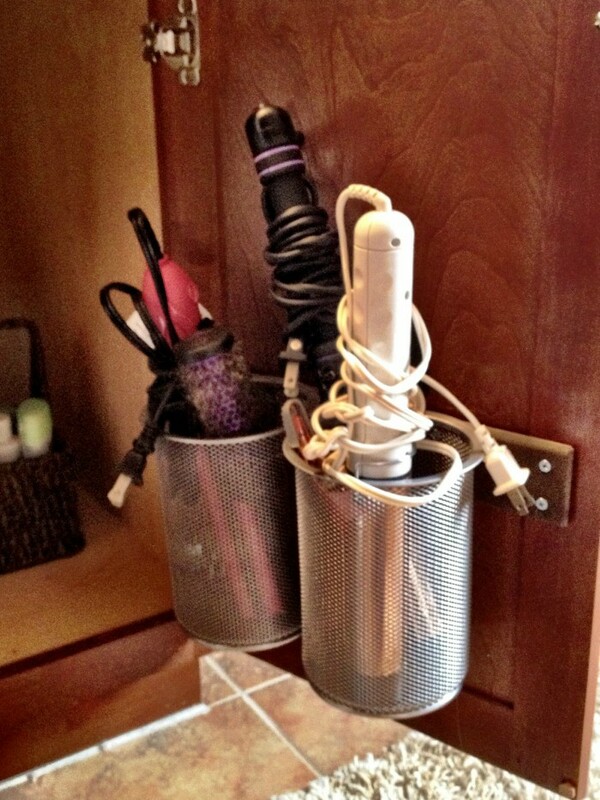 Hang your hair styling tools on the inside of your cabinet using minimal space by making use of command hooks. Aren’t command hooks the handiest things ever? 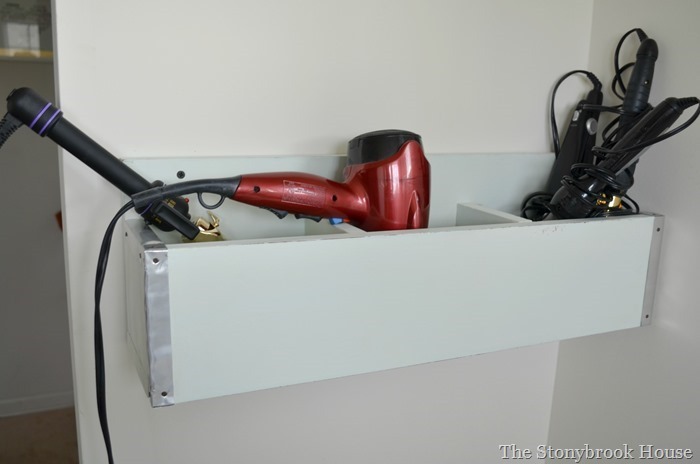 This one’s a great idea for a half bath: Hang a file box on the side of the cabinet to house your styling tools. I’m going to try this in my bathroom! This stainless steel utensil holder is a smart choice because you can definitely put your tools in them when they’re still hot. It’s attached to a Raskog cart… we absolutely love the carts, too! 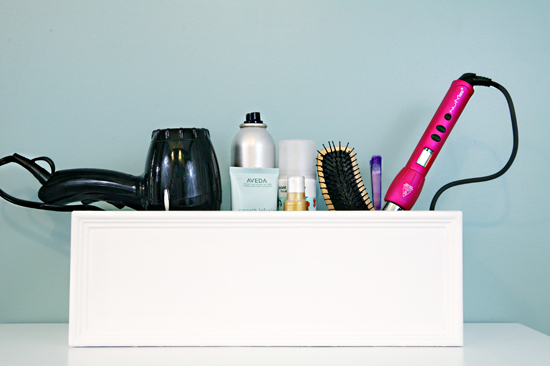 Add small paint cans to a wooden box to recreate this DIY hair tool organizer. It’s small enough to fit on the back of the toilet if counter space is limited. 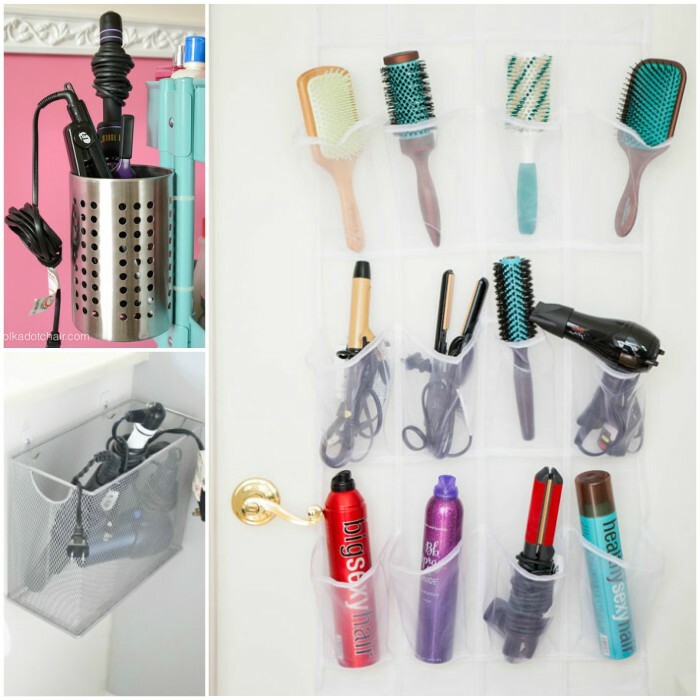 This wooden hair tools organizer is simple, with three compartments, and is attached to the wall above the sink. 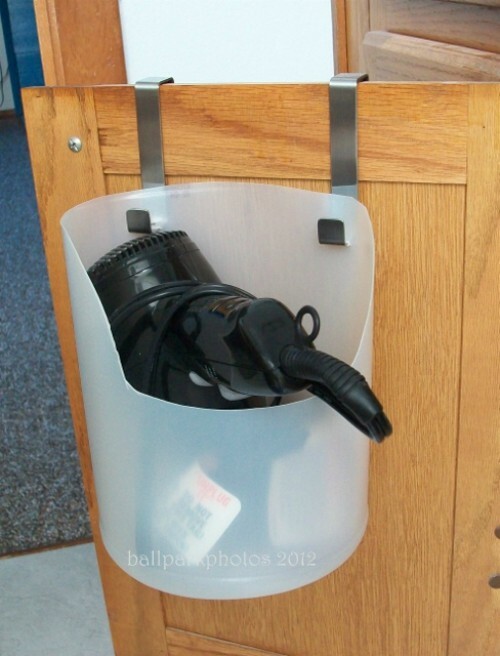 Make a hair dryer caddy out of an old plastic bottle. There’s an idea I would never have thought of! You know what never fails? 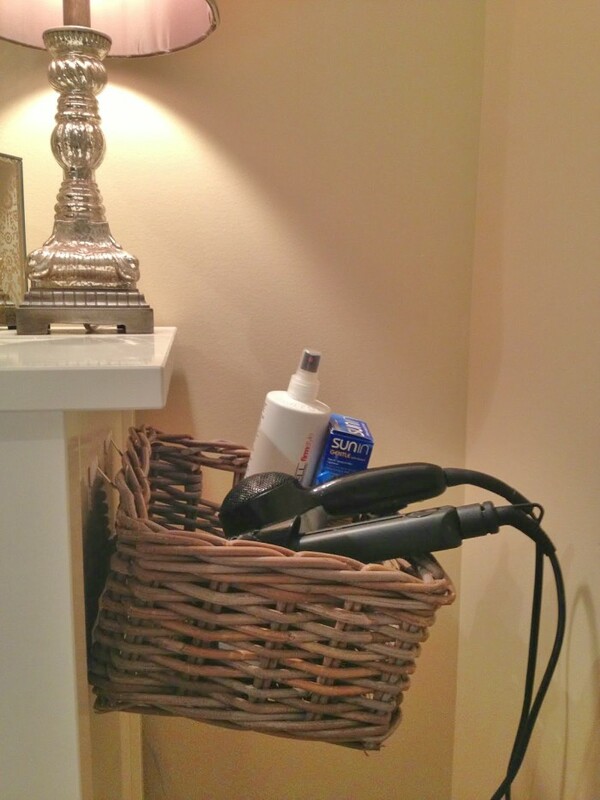 Basket hair tool storage. 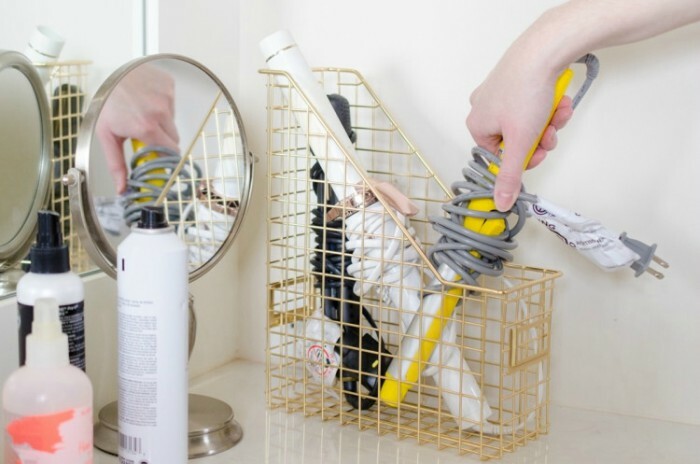 Seriously, you need a couple of baskets in every single room to keep things tidy. 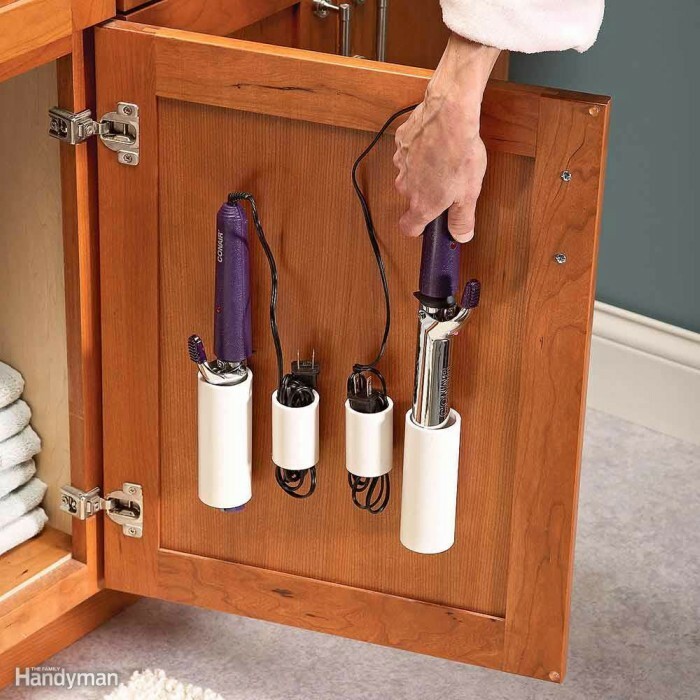 Attach pencil canisters to the inside of your cabinet. You probably have one or two lying around, anyway (if you’re an office supplies addict like me). 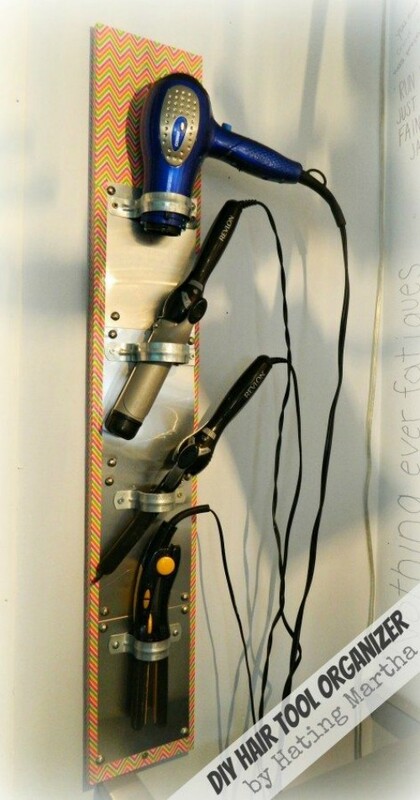 Make a vertical hair organizer out of a wooden board, some flashing and pipe clamps. The flashing keeps it heat-safe, so you don’t have to wait for the tools to cool before you store them. 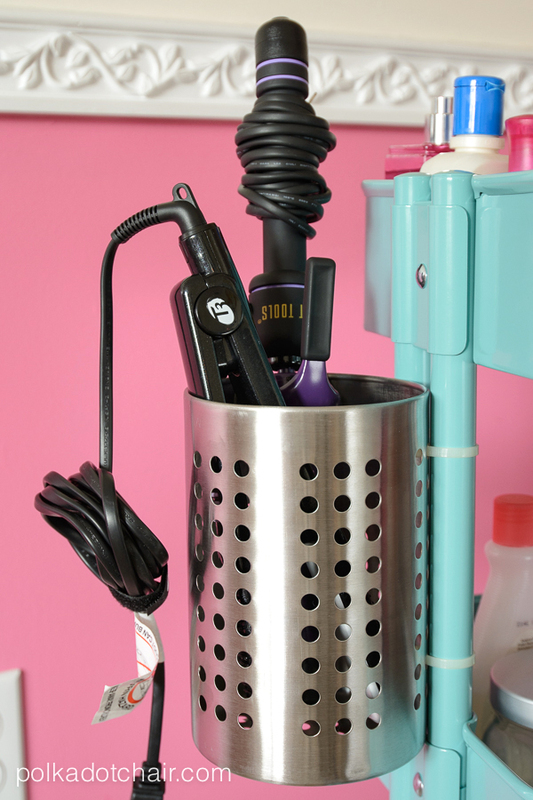 Turn cute pails into a hanger organizer for your styling and beauty tools.